The main body of this efficient rancher is a mere 1073 sq. ft. but there are no amenities missing here. 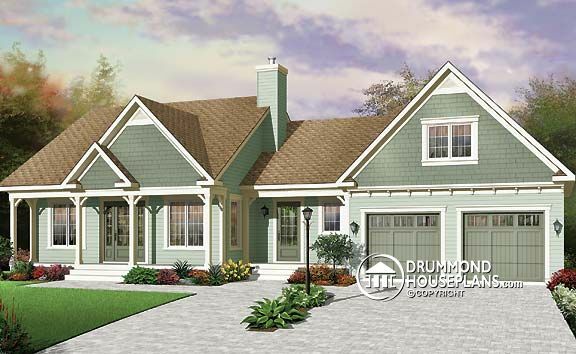 In fact, this attractive home has a luxurious little secret – a fully private master suite in bonus space over the garage! Sloping ceilings add a special style to this secluded master loft complete with master bathroom and walk-in closet. The main body of the house features a semi-open concept with the living room oriented to the front of the house but within easy reach of the kitchen. A combination of shower room and laundry room ensures quick recycling of laundry at source. This plan includes a full undeveloped basement or change it to a crawlspace and gain space in the living room. A double garage is the final feature, but one that is sure to be appreciated. Looking for other 3-bedroom designs? Check our 3-Bedroom Design Collection or Create a “New House Plans – Latest Trends” Alert to receive all of the latest designs direct to you by email!